This is our second winter in Southwest Colorado. Living for 44 plus years in Texas didn't prepare us for narrow mountain roads, snow/ice, no cell phone reception, limited shopping opportunities, and mud. Now, I know some of y'all are chuckling because this is no big deal to you. It was culture shock for us. Old-timers' tips were invaluable and we put them into practice. Knowing generally what to expect was very comforting. Along with the sage and timely advice came some tall tales and fascinating facts about Colorado. 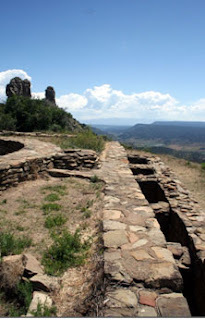 We heard about the school that had been in our cow pasture, about the stagecoach station three miles east on the banks of the Piedra River, and the Ancestral Puebloans at Chimney Rock on the high mesa a little further up the road. From our horse pasture, we can see the twin spires—Chimney Rock and Companion Rock, standing ready for the May15 - September 30 tourist season. My love of history kicked into high gear and we started exploring the history in our own backyard. Chimney Rock, on the southern edge of the San Juan Mountains, has been on the National Register of Historic Places since 1970. On September 21, 2012, it was established as a national monument. Visit http://www.chimneyrockco.org/ for more information about this fascinating piece of history. The view from the top is breathtaking and worth the hike. The Guides from the Chimney Rock Interpretive Association are extremely knowledgeable and make the adventure worthwhile. It's believed that this site was used as a communication link between 10 Puebloan sites ranging in distance from 2.7 miles to 67 miles. Modern day experiments show that it could have been accomplished. The Ancestral Puebloans probably used signal fires or polished sheets of reflecting mica. For Perspective— The red "A" designates Chimney Rock, between Durango and Pagosa Springs. Discovering that one of Jerry's favorite authors, Louis L'Amour, has a ranch in the immediate area was thrilling. Starting in 1966, L'Amour and his family spent summers in Durango, CO. For over ten years, they spent the month of August in Room 222 at the Strater Hotel. He divided his time between writing in the front corner room and hiking in the La Plata or San Juan Mountains. For Jerry's birthday last year, we stayed in room 222. L'Amour wrote many of his Sackett series novels on the drop-leaf table still in this room. In honor of the occasion, Jerry read his favorite L'Amour novel while we listened to the ragtime piano in the Diamond Belle Saloon below the room. No wonder there's a lively beat to L'Amour's stories. Fred Harman grew up in Pagosa Springs, CO. In November 1938, he launched Red Ryder and Little Beaver comics as a Sunday strip and four months later it became a daily strip. Do you remember those comic strips? Did you read any of the Red Ryder comic books? I loved Little Beaver's feather! Harman promoted Red Ryder as "America's famous fighting cowboy." Harman was one of the original 1965 members of the Cowboy Artist of America and one of only 75 white men in history to be adopted into the Navajo Nation. The Pagosa Springs SUN is the only newspaper in the United States that currently publishes the Red Ryder and Little Beaver comic strip. I get to read the strip every Thursday! The Fred Harman Art Museum in Pagosa Springs houses a large collection of original artwork and memorabilia on the American West. Visit http://www.harmanartmuseum.com/ for more information. Last year I submitted a novella "Christmas Gold" that incorporated the camels brought from Turkey, Egypt, and Tunis to assist the military in the desert around Fort Davis, Texas. Imagine my delight when I discovered that some of those camels, imported in 1840 and accompanied by Jacob Acabajal, had found their way to Bent County, Colorado. Like the moose that are being repopulated around Bayfield, the camels are still out there and frequently sighted. I've seen the moose. Now, I'm on the lookout for the camels. Keep your eyes open and look around for history in your own backyard! Linda, how lucky you are to live in an area so steeped in history and with such inspiring scenery. And it's also great that you have access to folks who can give you information on the surroundings and the lore. Thanks so much for sharing those pictures and some of the history with us. We do feel blessed, Winnie. Our Lord has taken my fear and trepidation about making an unexpected move and major change in life style and turned it into the sweetest experiences. He's uses both my love of history and Jerry's "all things ranching" and melding them into a wonderful time. I agree with Winnie above, Linda, you are truly blessed to be living where you are. Me? I live in an apartment with no back yard and nothing interesting to see anywhere around it. I am praying that this is just a 'stop over' for me and my hubby and that the Lord is going to bless us one day with a great place to live...with a beautiful view. Your post was quite interesting. Thank you for sharing and God bless. Hi, Debbie, it is quite a departure from 2.5 acres of forest in Bastrop County, Texas to 129 acres of mountains and dangerous critters. I'll be praying with you that our Lord will hasten your "stop over" and turn it into the garden spot of your dreams. We have a turkey licenses and could have shot a beauty from our back porch, but we enjoyed watching him feed more than wanting to cook him for dinner. Love the history and would love to see the area. I can imagine how it would be moving to a colder area. We have mild winters compared to some. More like Texas. we do go down to under 32 overnight but most days are around 54ish. although we think thats cold. Hi Jenny, it is all in the perspective, isn't it. I'm getting the hang of layers and always grabbing a jacket no matter how bright the sun coming in the windows. Today it's up to 71, but will be below 35 when the sun goes down. I enjoy sharing my little discoveries. Thanks for sharing them with me. It's true that there is probably a lot of fascinating history in our own backyards - if we just search for it. I become more interested in genealogy & the history of places/things - the older I become, maybe something to do with realizing my mortality? I toured the western side of Colorado a few years back - saw some beautiful country & interesting sites, but I almost had a heart attack driving those narrow mountain roads that had no guardrails! Hi Bonnie, I wish now I had been interested in genealogy while my great grandparents were alive. Now that I'm researching, I have so many questions and no one to ask. All of the family albums, loose pictures that belonged to them have disappeared. I always look through pictures at antique stores and re-sale shops in their area, just in case someone dropped them off instead of destroying them. I have some pictures of those roads and I get queasy just looking at them. I remember when you said you were moving to Colorado, Lin. That's so cool that you've found so many historical elements there. Where I live is rich in history too. About 125 years ago, it was Indian Territory and belonged to the Creek Nation. And, I appreciated your prayers all during that hectic time. The only bright spot, at that time, was being a finalist in the ACFW Genesis Contest - Young Adult category, and getting to go to the ACFW annual conference. We live on private land within the Southern Ute Reservation. Our deed goes back to 1823. I can't wait to research this strip of the Piedra Valley. To be honest, I'd never heard of Fred Harman - didn't know there ever was a comic strip about cowboys! How fun that you get to read that bit of history each week in the paper! I visited Colorado a couple of times when I lived in Wyoming, and it's such a beautiful place, although at the time, history didn't interest me like it does now. But there's certainly a lot of interesting lore in all places Western! And I love that history in the West is still pretty much just like it was, not all fixed up and restored. When you look at an outlaw's dugout, or the tracks of the Oregon Trail, it's just as it was left (for the most part). That really makes history seem more real to me than visiting someplace with actors dressed up in period costumes and spouting lines. Oh, I also was fascinated to learn about the camels in Texas and Colorado! I had never heard about them being brought in to assist the military. So, do they just run wild now, or are there some kind of farms or reserves for them? Hi Bethany, there were more than 35 movies and serials, starting in 1940 with The Adventures of Red Ryder, a 12-chapter serial. The movies latest until 1950. The comic books were launched in 1941 by Dell Comics. If you come across any of them, they're collector items. I remember that JC Penney stores had Red Ryder Corrals. My brother had a Daisy Red Ryder Carbine. Visiting the museum was a real trip down memory lane. It's never too late to fall in love with history. I agree that the best places are the ones still intact. We visited an old fort in New Mexico that had the original Santa Fe Trail wagon tracks. That just sent chills down my spine. Some of the camels from the U.S. Camel Corps were turned out to forage for themselves. Others were sold to ranchers, who subsequently turned them out into the desert. Only a few made it to animal sanctuaries. I don't know when the last authentic sightings were made. Thank you, Karla, there's so much more history about Red Ryder, the U.S. Camel Corps, and Chimney Rock, it could fill the whole month of blogs. That's the wonderful thing about history, we only touch the tip of the subject. I just love this blog. I learn something new every day! Hi Betti, one of the places I'd like to visit is the Great San Dunes National Park, the San Isabel National Forest, and Horn Peak. Some friends from Indiana stayed with us overnight on their way there. The pictures Myra sent were fabulous. It's fascinating what's on the other side of the mountain. We are ringed by the San Juan National Forest so we don't have any "other side" neighbors now, but the ruins of past ranches from the early 1800s still exist. I'm researching some of them now. What an awesome history to have in your backyard! That would drive me crazy (in a good way) wanting to know and learn all the fun history you have there.